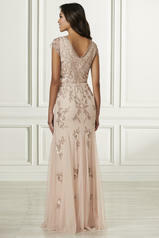 This V neckline, all over beaded gown, features a sheer cap sleeve detail. Thin rows of beading cover the waist seam. The skirt features soft godets.